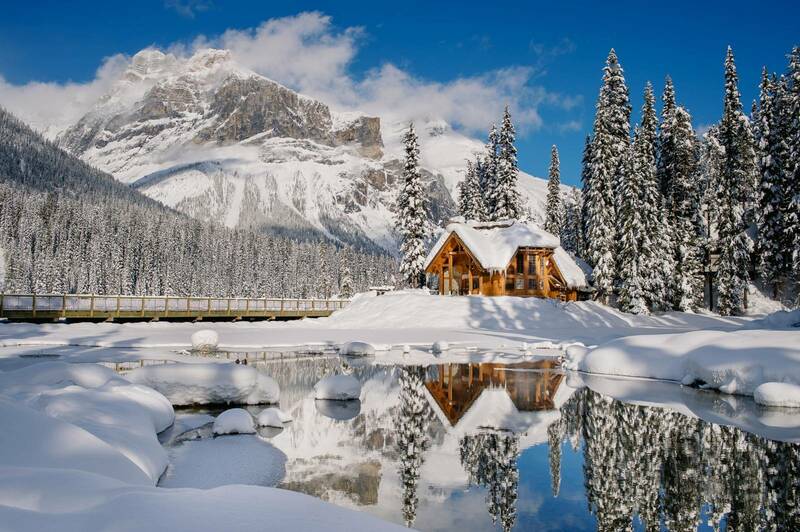 Emerald Lake Lodge is located in stunning Yoho National Park in British Columbia. It is about an hour and 10 minute drive from Banff. 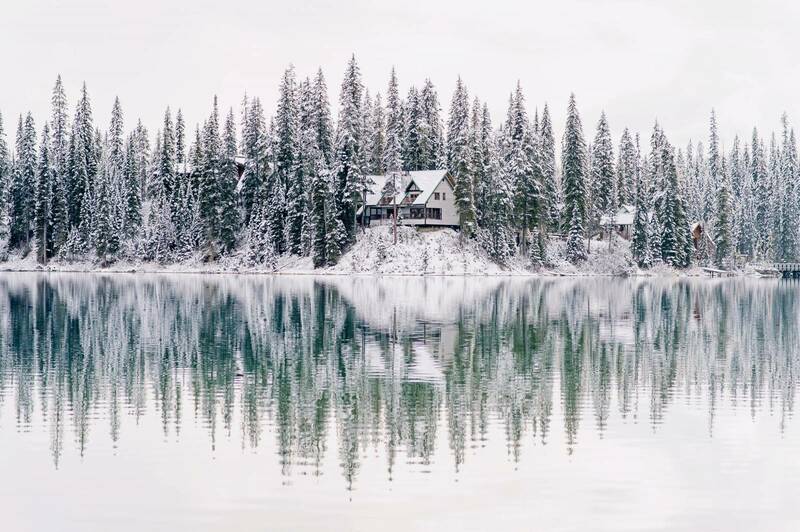 Emerald Lake is particularly stunning in winter. It is like being in a living snowglobe. A true winter wonderland! Depending on conditions you can snowshoe around the lake which takes about 2 hours or cross country ski across the frozen lake which is track set every year if snow conditions allow. You can rent both snowshoes and cross country skis right at the lake from The Boathouse Trading Co. which is the adorable green hut on the lakeshore. They open in December for winter rentals. 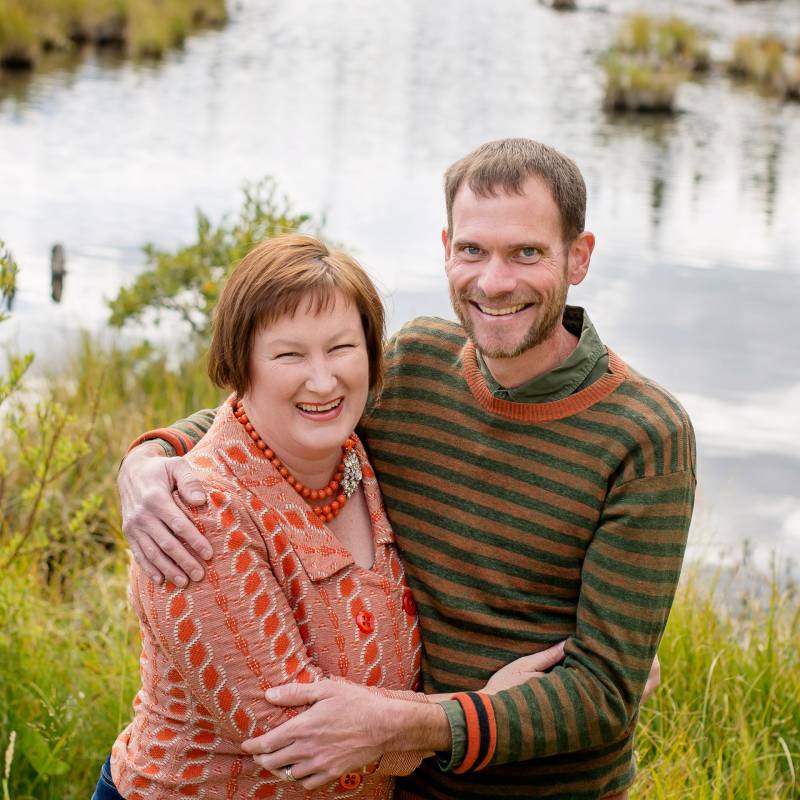 The Boathouse Trading Co. is a family owned and operated business that has been there for over 30 years. They also sell the best souvenirs in the mountains. I love photographing winter weddings and elopements at Emerald Lake Lodge. It is also the place that I love to spend time with my family on days off. Emerald Lake Lodge has a few pet friendly cabins so we love to plan staycations with our dogs. When you arrive at Emerald Lake Lodge you will park your car in the Emerald Lake Lodge overnight parking lot and leave your car there for the duration of your stay. You and your luggage will be shuttled up to the main lodge, therefore, I highly recommend that you pack with that in mind...consolidate your packing to as few bags as possible. If you are someone who is used to living out of your car during a stay you'll want to prepare your packing differently. There is thankfully no WiFi or TVs in any of the cabins which makes it the perfect unplugged retreat. Come prepared with books you've been wanting to read, the sketchbook you've wanted to fill, board games and cards to play, and the knitting you meant to finish to entertain yourself in front of the fire. There are fireplaces in every room which is my favourite way to spend the evening sitting by the fire. The fireplaces come pre-stocked with kindling and paper and matches so you have everything to start a fire easily. It is important to make sure that the flue for the chimney is open otherwise when you start your fire the smoke will have no where to go and you will fill your room with smoke. If you are unsure about how to do this definitely call the front desk before starting your fire and they can send a woodsman to assist or provide instruction over the phone. There are no fridges in the room. Often when couples order a cheese plate or have leftover cake from their elopement they think to store it outside on the deck to keep it fresh. The pine martens and stellar jay birds have all figured this out too and will definitely eat any and all food that you store on your deck. There is a gas station located in Field but it is closed for a good portion of winter so make sure you fill up with gas in Lake Louise or before so you are not stuck. On clear nights make sure to step outside your cabin and walk down to the lake to stargaze. The starry nights at Emerald Lake are beyond beautiful. Some of the rooms at Emerald Lake Lodge are pet-friendly so your dog can come play in the snow with you! There are thankfully no TVs or WiFi in any of the rooms so come prepared with your favourite books, boardgames, sketchbook and sit by the fire with a glass of champagne. You can have drinks or eat in the lounge and enjoy the sound of the fire crackling. I love breakfast in the Mount Burgess dining room with views of the lake. On the second floor of the Main Lodge you'll find a billiards table and a TV by the fire. There is an outdoor hot tub so bring your suits. This is the Boathouse Trading Co. that opens in December and rents snowshoes and cross country skis to lodge guests. When snow conditions allow they track set cross country tracks right on Emerald Lake. We also love snowshoeing around the lake trail which takes about 2 hours if you stop and take photos like we do. I highly recommend the walk around the lake, it's gorgeous with abundant photo opportunities. 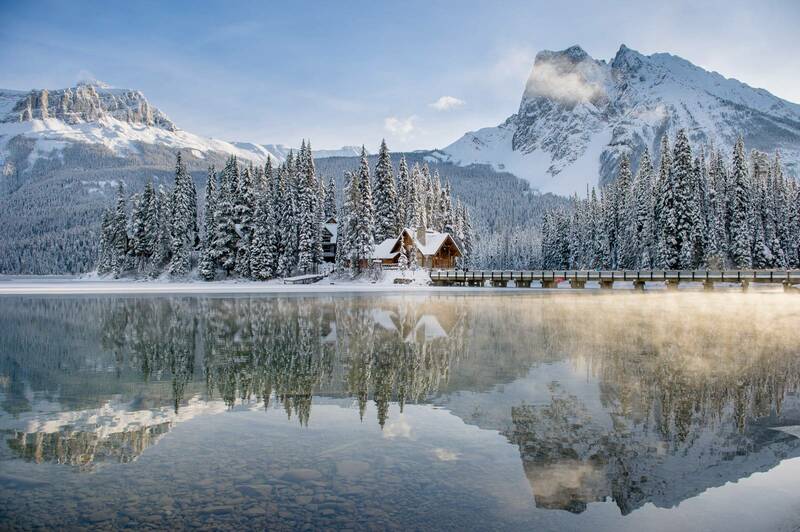 The beautiful mountain Village of Field is about a 10 minute drive away from Emerald Lake Lodge. There are 2 restaurants The Siding Cafe and Truffle Pigs, a pottery studio and a post office. It is a beautiful mountain village and worth checking out. In winter the restaurants keep limited hours so be sure to check before heading over for a meal to see if they are open.